Welcome to our panda periodical; where we will keep you up to date with all the latest news about the progress of our brand new red panda twins. It’s been panda-monium in the zoo following the birth of two panda puffs! As with the giant panda, female red pandas are only fertile for just one day a year and can delay implantation until conditions are favourable. Mulan gave birth to two healthy cubs on 16 June and the twins are making excellent progress, under the care of their first time mum. 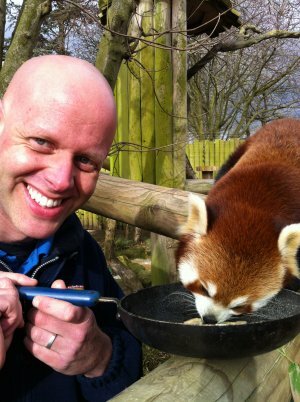 At Drusillas, the red pandas have three separate nest boxes and Mulan will move the babies around from one to another, carrying them gently in her mouth. For the first two days, Mulan remained with her cubs for 90% of her time, nursing the twins for 15 minutes per feed. However, on day three this dropped to around 60% which is the expected behaviour within this species. The cubs were born with pale fluffy fur, which darkens to the distinctive red coloration of the adults over the first three months. At first the cubs eyes and ears are tightly closed, opening within the first 2-3 weeks. Our cubs opened their eyes on day 21 and are now exploring the den. Soon they will be taking their first steps outside.